The prototype shed was located behind the Dolores Depot, and was originally a freight house. 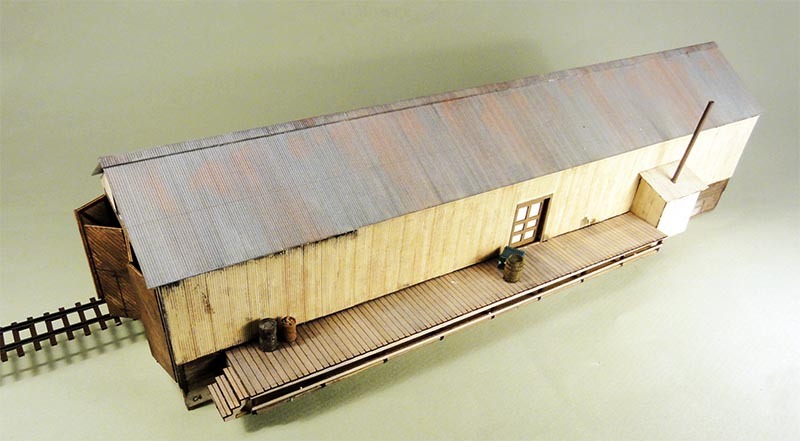 The RGS moved its freight operations to an old warehouse, and converted the building into a single-stall shed for its Galloping Goose fleet. A lone gas pump was located near the depot platform, facing the mainline. I am unclear as to whether maintenance was performed here, or the shed was simply a place to store the Geese between runs. The kit consists of fine quality, laser cut components of either thin, or thick, Binder Board; and excellent quality wood, along with a parts list, and instructions. The instructions are far better than previous NGC kits with illustrated diagrams that ease assembly. Of special note, is an innovative flexible hinge material that is to be laminated between the inner and outer door panels. Many other innovations, coupled with precisely fitting parts make this kit a joy to assemble. Assembly begins with a clever, interlocking, Binder-Board and wood foundation intended to eventually be counter-sunk into your layout. An inspection pit, and full exterior/interior wall detail are included. The Binder-Board wall core is overlaid with thin, scale, corrugated Binder-Board; and separate doors and windows that need to be added. However, some windows are part of the core assembly. The large doors operate, and have inner and outer detail. Very impressive! A centerline of posts allows the roof to be made removable, and is an excellent place to hang a string of lights, as I did. I pre-painted the doors, window, and trim, based on photos in the RGS Story. It appears to me that the building was painted with RGS depot colors: buff sidewalls and brown trim. I elected to paint the large doors a dark wood color to match color photos. I also treated the interior with lighter wood colors as recommended. Then I added some workbenches, and other interior details. After assembling the core, I added the pre-painted scale corrugated walls, lining up the windows, which exposed the ingrained timber detail of the core’s lower walls. This feature matches the prototype exactly, as does the provided inner loading dock. I then added the exterior loading dock and small, attached shed, and a smokestack that does not come in the kit, but shows-up in photos. By the way, the scale corrugated is the finest I have ever seen, but is also delicate, so be careful. 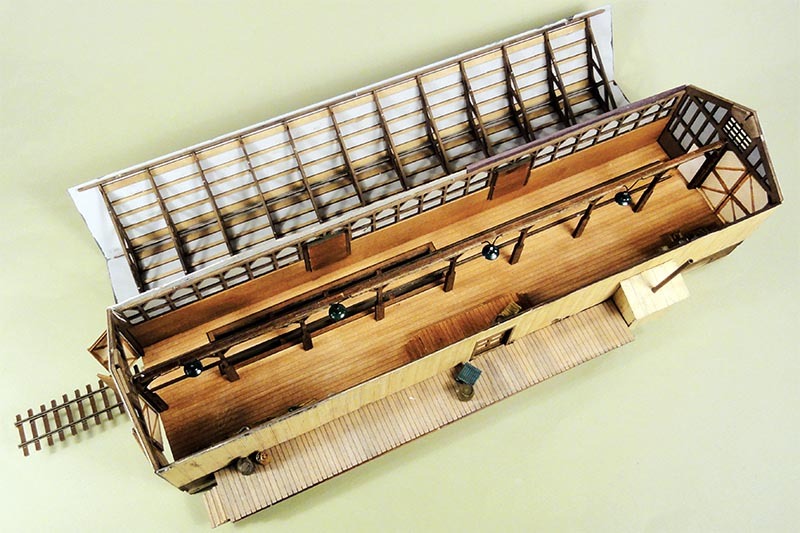 The roof assembly includes all the trusses for the interior, including end supports that allow the roof to “lock” into place, yet remain removable. I painted the corrugated roof a deep rust color to match photos, using Humbrol paints. The result is a highly accurate, and unique structure for a future Dolores, Colorado, scene. 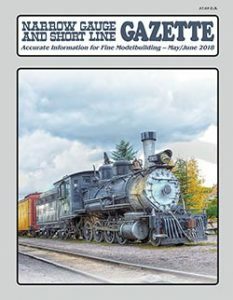 This kit was a joy to assemble, and I hope Narrow Gauge Colorado produces more Dolores structure kits.